Lindsay Powell amazes as Cake Bake Betty. Follow the link to better understand greatness. 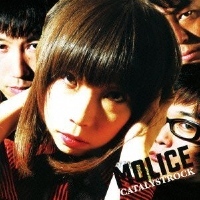 [Catalystrock] by Molice is a sophomore album done right. While their 2008 debut album, [Doctor Ray], was filled with shiny, tuneful tracks that harkened back to the Pixies, their latest effort modifies their sound into something more unique and satisfying. [Monster] starts things off explosively, with Rinko (vocals) and Yuzuru Takeda (guitar) running after the surf-garage ice cream truck, evoking Kenichi Asai's more energetic moments. [Android Said] and [Into You] have a similar verve and growling attack, with a deep groove topped by sparkly guitar flourish, and expert rhythm from Ikuhiro (bass) and Takashi Koyama (drums). Much of the album has this infectious sound, but some tracks like [Romancer] stir up the dance floor properly, layering in more funk than punk, and it's hard not to sway and sing along. Rinko leads the party with female vocals - largely in Japanese, with English punctuation. She's effortlessly shifts from a near scream to slinky swoon - [Monday Runs] and [Fine Wave] are examples of the latter, taking things down a notch and slightly towards balladry. This slower side of Molice would be the perfect sound track for a filmic montage, of someone aimlessly staring out the window while driving down the interstate. It's that sort of variety - reckless abandon swirled with contemplation - that really drives my interest in this album. You have the brilliant, simple pop of [Perfect Morning], evoking Shonen Knife and Puffy, with sprinkles of the Noodles, immediately followed by [Let's Merge! ], an invigorating, aural slap on the shoulder with off-the-leash guitars. These are two sides of of the same die that Molice rolls through the 12 tracks, and every variation that comes up is solid and worth repeat listens. That said, I'm more of a fan of the loud, up-tempo tracks - many of the slower songs have great moments, but are occasionally tedious. I can only imagine how more powerful a collection of just the more rockier songs would be, but I can understand the positive effect the slower fare has in the overall sequencing, which is fine and makes for an album that's satisfying to listen straight through. My favorite song is [Still Alive], which is just over 90 seconds of hi-impact brilliance, sending out multiple waves of fast-paced joy - I really can't get enough of it. [The Haze] ends the album on an equally pleasing note, the sort of slow fast slow always ramping up rock-out that speaks to the power of [Catalystrock] - it's only over long enough for you to catch your breath and happily start again. I received a free copy of [Catalystrock] for review from representatives of Molice. I also pre-ordered a retail copy of the album well before the review was arranged, due to my love of their first album. That retail copy hasn't arrived yet. Or, go to http://www.envoletmacadam.com/ - click the Japanrocks! banner then click on the Molice profile. People can vote once per day per IP address. No registration or submission of personal information is necessary. Omodaka, Red Bacteria Vacuum, OKAMOTO'S, JinnyOops! and "more bands"
CHATMONCHY will perform at the NY, SF and LA shows. Go here to find out more about each show. These are almost the same stops as last year, so those in the know, know where to show. I will try to catch the tour in SF, but attendence at any stop near you is recommended. 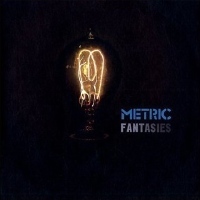 1) Metric, [Fantasies] - Munich springtime, singing out loud in infinite repeat, burning dance rock prize. 2) Tegan & Sara, [Sainthood] - Moving from folk to machine, the twins knit wings and attack the sun. 3) Paramore, [Brand New Eyes] - Stadium rock posture brings mysterious, complex, post-Twilight pop punk. 4) Sky Larkin, [The Golden Spike] - Brilliant melting Sugarcubes on top of floating amps and golden halo. 5) Butterfly Boucher, [Scary Fragile] - Return of the singer-songwriter-zen-master, genius of multisound. 6) Elle Macho, [es Potencial!] - Butterfly Boucher brings friends over, 5 songs of aching brilliance. 7) Dananananaykroyd, [Hey Everyone] - 12 chant-rock songs playing to a stadium full of fashionable amps. 8) Utada, [This Is The One] - Hikki rolls the dance floor down & picks up the pace, fancy-free R&B kisses. 9) Spinnerette, [Spinnerette] - Brody Dalle just needs to growl in my direction and I'm digging trenches. 10 Popular Songs, [Yo La Tengo] - My 20 year long distance love affair with Hoboken sonic bliss pays off. Alternate choices: Built To Spill, [There Is No Enemy], Miniature Tigers, [Tell It To The Volcano]. 1) TsuShiMaMiRe, [A, Umi Da.] - Stage diving, speaker standing, mic smells and female punk rock pop joy. 2) Ringo Shiina, [Sanmon Gossip] - The full flowering of Tokyo Jihen blows back and pollinates everything. 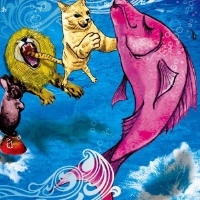 3) Kaela Kimura, [Hocus Pocus] - Pop rainbows, miles above the rest and seeding clouds with C.C. Lemon. 4) Mass of the Fermenting Dregs, [World Is Yours] - Six songs, twinkling gems of feminine guitar sparks. 5) Mowmow Lulu Gyaban, [Noguchi, Kutsukawa de Bakushi] - Party funk noise punk pop smeared with fun, Yuki. 6) Tommy heavenly6, [I Kill My Heart] - A glam rock Brilliant Green, with sticker hearts and skulls. 7) Go!Go!7188, [Antenna] - Another example of you can't go wrong rock, just trust in Yuu, Akko and Turkey. 8) Kenichi Asai, [Sphinx Rose] - More of the same greatness, guitar god thunder clouds bursting poetry. 9) Superfly, [Box Emotions] - Cocco meets Love Psychedelico, post-packaged shiny rock pop for the masses. 10) The Mirraz, [Necessary Evil] - Lookout! dance punk that makes you slam dance slowly in cubicles. Alternate choices: Boredoms [Super Roots 10], OOIOO, [Armonico Hewa], UA, [ATTA], Molice, [Doctor Ray] (12-2008). Thanks to the tireless efforts of BENTEN records, there's going to be an extra-special Japan Nite hitting San Francisco and Los Angeles in mid-August. Free show /all day out door event. It goes without saying that I will be at this show, no matter what. $16 advance / $20 at the door. Japan Girls Nite in LA! These are all great bands, so please try to attend one of the events if you can. Molice has a strong Pixies influence - more specifically, the guitar sound is close to latter-day Joey Santiago, all desert-surf and sunny melodies. They've been hitting Shibuya, Akihabara and Shinjuku hard, and the constant shows and 4 demo CDs eventually produced [Doctor Ray], their first album. It's quite a solid effort, with 12 songs that grab you from the get go, and don't hit the brakes until you're sonically satisfied. Now that you've heard more of their music, pick some song titles that sound like they might fit potential future Molice songs. Titles in English or other languages are fine. 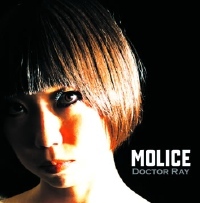 Molice will pick the best three entries for potential use on their next album, coming soon. Each of the 3 winners will walk away with a brand new version of [Doctor Ray], autographed by the band on the cover insert, given to me for free especially for this contest. It has twelve songs, all of which are great. All entries will become the property of Molice. Don't you want to potentially have your song titles used by Molice? All you have to do to enter is to e-mail me, and use Molice Song Title Contest as the subject. That's it. Your email address is your entry - include your song titles in the message. It's OK to send just one song title, or you can send more. Each person will have only one contest entry, no matter how many potential titles you send. If you are following me on Twitter, then you can also enter that way - follow me, and then send @junkmagnet a message to Molice Song Title Contest. Include your song titles in the tweet. If they don't all fit into one, then tweet again. That's all you need. You can enter until 7.15.2009. Only residents of the United States can win, since I'm not shipping abroad this time - sorry about that. Peer pressure! No, actually, once I started using Twitter for work purposes, I came to see the potential of using it to evolve JM a bit. 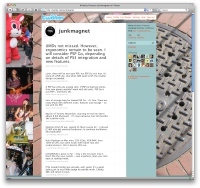 So, you can now visit http://www.twitter.com/junkmagnet for a few updates most every day about things that used to be commented on in junk.log. Plus, if you also have a Twitter account, and follow me there, you'll be automatically entered in the many upcoming contests I have planned. For those who can't quite remember the sort of things I've given away in the past, then the contests page can enlighten. If you're wondering about the missing year for this website, it's explained fairly easily: I became distracted by other things, like TV, video games, social events, and thus didn't set aside evening time for JM.com. Now, I've decided to give it the old post-college try, so we'll see what happens henceforth. By the way, there's a new Molice Contest going on now that you can enter via Twitter - see the details in the article above.